In April of 2010 I first heard about Earthing from a Alternative Natural Health Seeker / Guru David Avocado Wolfe. He was a guest speaker at one of my FAVORITE personal and business development company Peak Potentials, a T. Harv Eker, my mentor, company. David Wolfe is a great leader of natural health and travels extensively spreading the word on natural healthy, superfoods, raw foods, natural healing, longevity, toxin cleanse, and many more leading / bleeding edge health topics. 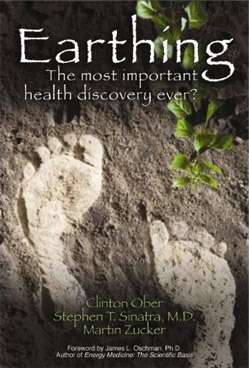 David had another gentleman Clint Ober speak with him about “Earthing” which is also the title of a book he wrote along with Cardiologist Stephen T. Sinatra, M.D. and Martin Zucker. I was fascinated and have been learning as much as I can on the subject. Coming from a computer programming background where in the computer lab BEFORE you touched a computer you had to ground yourself on a grounding pad, I understood that our bodies carried static electricity and if you then touched a computer your discharge could ruin the computer component. Also, being an apprentice electrician as a teenager I had some knowledge of the grounding required of the electrical system within our homes. Additionally, everyone knows that some electrical devices have the third prong of the plug and that third prong is connecting to a ground circuit. 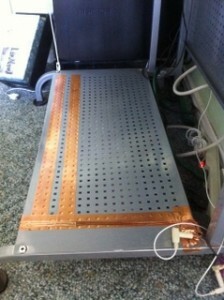 These more complex devices like refrigerators and computers require a connection to ground in order to work properly. Grounding or Earthing in the best possible way. One very interesting tidbit of information I heard was that the bottom of our foot has more nerve endings per square inch than any other part of our body. Why would this be so? Think about it. Our feet our PLUGS!! And they are designed to “plug in” to the Earth, or Mother Earth. Our nervous system is our body’s electric system. This electrical system requires good hydration, healthy passages so that electrical messages can be sent, and low interference. Remember our bodies are complex machines and just like computers and refrigerators require a connection to ground to work properly. If you look around with modern devices like shoes and high rise buildings we as humans are spending less and less time in connection with the ground or earth. You know how when you go on vacation or spend time at the beach with your feet in the sand and water? You know how you come away feeling energized and relaxed or “grounded!”? And you are! 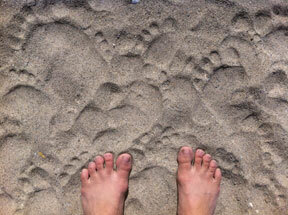 There’s a lot of real evidence on the health benefits of grounding. Blood samples taken before and after grounding show red blood cells before clumping and in a static state then afterwards bouncing, charged and healthy. Inflammation which is being called the common denominator to many of the current man’s illnesses and diseases are said to be caused by free radicals that steal electrons from healthy cells starting inflammation. 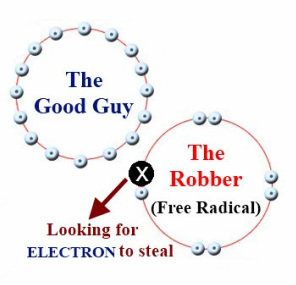 These free radicals are electron starved cells that we can help by keeping our bodies bathed in natural antioxidants. Earthing is the most natural antioxidant and just by standing in connection with the earth which is negatively charged, electrons will travel into our body at a rapid rate. Natural antioxidants! Inflammation reducing! The most interesting to me because I have been able to test it with a volt meter is the immediate effect of grounding on the amount of voltage carried in our body. By holding a meter and walking around my house I can see where the EMFs of the various electrical devices affect my body. The voltage when working at my desk with the computer, monitor and UPS can be up to 6 or 7 volts! Then when I touch a grounded surface that voltage IMMEDIATELY dissapates! 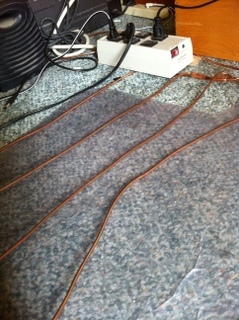 If I let go of the grounded pad then the voltage is immediately back. It’s quite compelling and is a good, fun thing to do with visitors and friends. Think about it this way, our bodies are electrical machines, right?! EMFs are electrical interference. You know when you are on your cell phone and you hear the static? Well the interference is affecting the cell phone, just like any interference could affect your body, and not in a good way. The phrase “Get Grounded” now takes on a different meaning, doesn’t it? So bottom line: what do you do? In my home I have grounded all the sleeping areas because we spend more time there than anywhere else. At first I purchased the grounded pad and slept with that under my neck but after a while I upgraded to the half sheet that is grounded and is wrapped around the bottom portion of our bed. I know there’s a cost to the sheet but unless you want to sleep with wire to tangle up in this is the easiest way AND you only have to buy it once! Ground Computer Areas. I have purchased a computer pad for the desk tops but I also designed (For FREE) grounded areas for the computers in our homes. In one case I used copper snail tape to create a grounded area where ever one of my kids would place their feet and under my husband’s desk I bend some copper piping into a sort of mat so that when he worked with his socks on the grounding would work. I of course tested it each time and with the snail tape I found that the sticky side didn’t conduct so I had to use copper wire to spread out the conductivity. 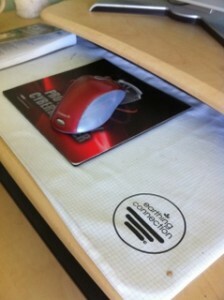 I travel with my grounded mat so am protected even when I’m away from my own bed. Our sofa area is set up with a few of the grounded plugs so that my kids when they have their friends over and they are all on their cell phones, iphones, whatever they can be protected. I actually cringe each time I see a kid pull a laptop onto their lap without being grounded! All the products are available in this Amazon store so please have at it. Get Grounded! Protect yourself and your Kids! Don’t let them sleep with their cell phones under their heads! See the store Rose’s Amazon Store This is an Amazon link, you will be purchasing from Amazon and the costs are the same but please purchase through my link as I get some credit for sending you there. I appreciate it very much. These are my favorite products but of course you can make your own connections to the earth and especially as much as possible get out there and get barefoot!